ACE inhibitors are a class of commonly used antihypertensive drugs that lower blood pressure by relaxing arteries and promoting excretion of salt and water. ACE inhibitors also have also been shown to protect the heart, in part by reducing collagen deposition. 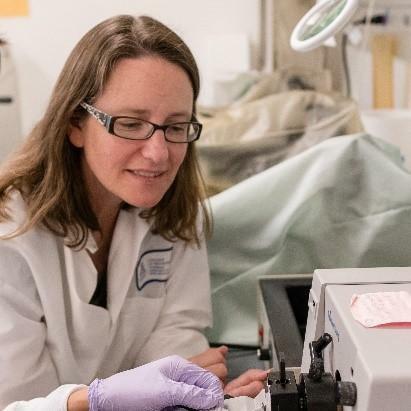 "If we can identify subsets of cells that may appear with the development of hypertension, we can develop tools to directly target those cells and prevent progression toward heart failure," Dr. Hale said. "Heart disease has been the No. 1 killer for decades," Dr. Hale said. "In the last 10 years or so we have more people surviving heart attacks, which is great, but consequently we have more people progressing to heart failure." "We need to do better, and right now with the drugs that we have on the market we still see this progression to heart failure," Dr. Hale said. "We need to find new treatment strategies to stop that course." Dr. Hale's NIH grant No. is 1R56HL141165-01. To learn more about her research, please visit http://phoenixmed.arizona.edu/about/news/taben-hale-phd.